Drivers will face stop-and-go conditions for maybe 12 miles entering Seattle this weekend, as crews repair two lanes of the 53-year-old Interstate 5. 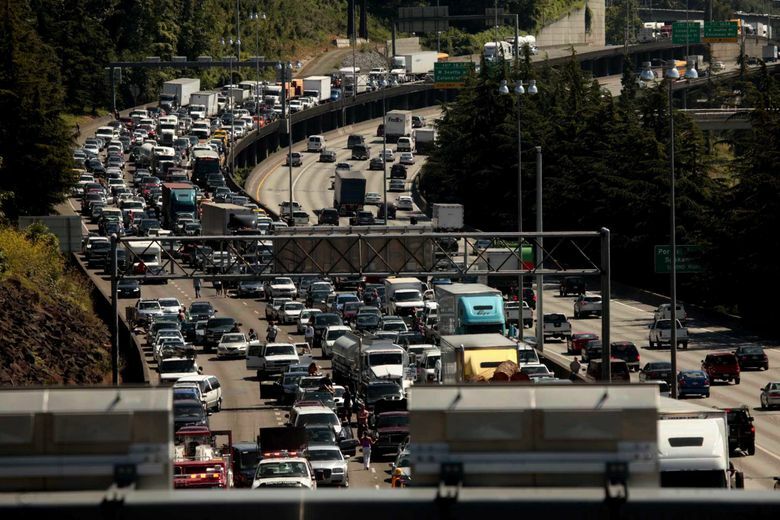 Long delays await motorists who dare to travel this weekend on Interstate 5 into Seattle. In Seattle, repair work will shrink the freeway to two northbound lanes through Sodo. The blockage will also reduce southbound capacity from Northgate to downtown, because the I-5 express lanes will point north all weekend, to relieve Sodo traffic. Contractors are scheduled to replace concrete and portions of 10 expansion joints, from the West Seattle Bridge exit to Highway 520. Several ramps will close, in particular the Mercer Street onramp northbound. Drivers leaving South Lake Union must enter the express lanes to go north — which means no chance to weave toward the 520 bridge. These shutdowns will last from 8 p.m. Friday until 5 a.m. Monday, in the third of six big weekend work sessions for the “Revive I-5” program this year. This past weekend, drivers tapped their brakes at South Beacon Hill, all the way into downtown. In addition, the Ship Canal Bridge northbound will shrink to two lanes, Saturday morning from 3 a.m. to noon, and Sunday mornings from 3 a.m. to 10 a.m. The far left lane will remain closed all afternoon and evening Saturday while new concrete cures. Traffic snarls will be compounded by two events at KeyArena, a concert in the Tacoma Dome, and three Mariners baseball games, state officials warn. They advise canceling trips, carpooling, taking light rail, or detouring onto Highway 599 from Tukwila into south Seattle. A planned closure of westbound Highway 2 to Everett this weekend for pavement repair has been postponed due to the weather forecast. Last weekend, I-5 delays caused spillover traffic jams on northbound Highway 99, where buses in their Sodo transit lane passed stop-and-go cars. Snoqualmie Pass travel will be stymied by eastbound I-90 lane closures, for ongoing concrete replacement between North Bend and Denny Creek. Montlake Bridge will close to motor vehicles during the annual Beat the Bridge run from 7:30 to 10 a.m. Sunday. Looking ahead, South Lander Street in Sodo will close Tuesday night for construction of a new bridge above regional freight and commuter-rail tracks. The blockage between First Avenue South and Third Avenue South is expected to last until early 2020. Bus routes were previously changed to avoid the site. The $123 million structure will provide one lane each direction for cars and trucks, additional left-turn lanes and shoulders, and a walk-bike trail along the north side.